“In Utah you’ve got to do things slow. If things change they change slowly.” So says long-time Utah artist Darryl Erdmann as he sips a pepsi in his Sugarhouse studio. Erdmann should know. A native of Brigham City, he has been working in the Utah art world for a number of years. 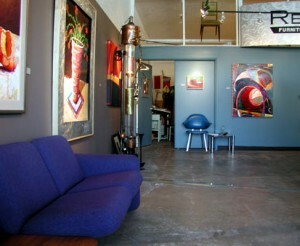 Either as gallery owner or artist, Erdmann has been witness to Utah’s slow adaptation to change. In the late eighties Erdmann ran the Salt Lake Contemporary Gallery in downtown Salt Lake where he showed minimalist and colorfield art at a time when “Mark Rothko wasn’t a household word.” Reception to the gallery was not overwhelming and it eventually closed down. Since that time, abstract art has failed to achieve a pervasive presence in Utah. The Salt Lake Art Center has had more and more exhibits highlighting contemporary art and Phillips Gallery has survived showing abstract work, but few other venues for abstract art have proven viable. But Erdmann is trying one more time with a gallery. In the past six months he has slowly changed his Retro Furnishings, which specialized in original sixties era furniture, into the Chroma Gallery. The furniture store always had his pieces hanging on the wall. Now, however, as the furniture has, piece by piece, gone into the homes of collectors, the paintings have become the dominant elements. Erdmann has added works by other artists to the gallery space, taken down the Retro Furnishings sign, and stenciled his new gallery logo on the outside windows. “I would have never thought to do this,” explains Erdmann,” but SaltLake has changed in the past five or six years.” Erdmann says that a shift in demographics and a robust econcomy has helped make marketing contemporary abstract art more feasible. More people in Utah are able to consider buying art and as more and more people move into the state the number of those interested in abstract art has increased. Erdmann has also found success with clients outside of the state. The Olympics has already brought him a few customers and he says he sells both art and furniture to collectors from coast to coast. The evolution which has created the Chroma Gallery began a few years ago when Erdmann was operating a furniture store in the Holladay area. One day, while customer Dave Johnson was purchasing a chair, he mentioned to Erdmann that he was planning to transform the recently vacated Rockwood Furniture building in Sugarhouse into artist studios. Erdmann said he was definitely interested. 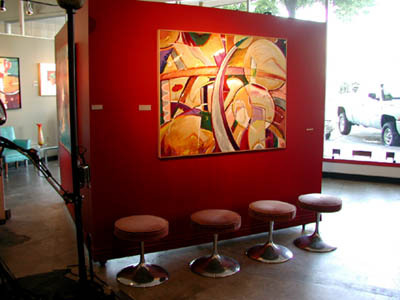 His interest became delight when Johnson returned months later and said, “I saved you the front windows.” The windows came with a 25′ x 25′ gallery space, now vibrant with Erdmann’s abstract work, as well as a 15′ x 25′ studio space. “I did the furniture for about a year and then I decided I wanted to do the art,” Erdmann explains as he relaxes in his spacious studio space where piles of acrylic paint tubes are littered across a table that faces a large easel. People can be heard in the gallery space and Erdmann steps out for a moment to chat with a couple of kids who have stopped in the gallery, attracted by the large sculptural works of Andrew Smith. Erdmann turns the work on and the gallery is filled with the sounds of gears and cranks churning away. The sculpture’s noises aren’t the only ones in the gallery. Jill Davis can be heard working in her nearby fame shop. Due to a zoning ordinance, none of the spaces can be completely closed in. Open spaces towards the ceiling on all exterior walls lead to what Erdmann describes as a more “communal experience.” No artist here is an island, at least when it comes to hearing the others. “I have to choose the times when I really want to work.” But work he does, even if it has to be at midnight. Every new visit to the gallery reveals a new work, strong in design and bursting with color. A few of his pieces are representational, to a degree. A flower pot or oversized coffe cup, in a style reminiscent of Wayne Thiebaud, can be found on the wall. “Here in Utah I had to prove to people first that I could draw,” Erdmann says in regards to these pieces. But it is obvious that his own excitement is for the purely abstract works. They are by far his stronger pieces: swirling planes of colors, slashed and intersected by equally bright counterpoints. The touch can be rough and expressionistic or crisp and defined. Erdmann’s gamble now is that Utah has evolved enough to where his work and that of artists similar to himself can be embraced. The Chroma Gallery may be the result of a slow evolution, but it has been an organic one, advantageous both to Erdmann and the community. It is one more decisive element that is making the Sugarhouse area a center for artists in Salt Lake City. Erdmann in his studio, adjacent to the gallery space. When everyone else has gone home, the former studio drummer for Capitol Records can be found here listening to Miles Davis while he paints. Darryl Erdmann received a BFA from Weber State College in 1974. 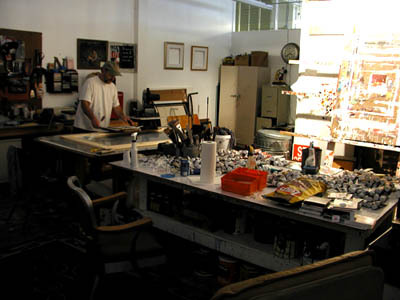 He has been a professional musician, operated a number businesses, including D/E Signs and Salt Lake Contemporary Gallery, and exhibited and sold his artwork in Utah for a number of years. His works appear in private and pulic collections across the country as well as in a number of movies.